One of the biggest reasons for the popularity of Tee-ball is its simplicity. There are very few rules to play the game and there isn’t much equipment that’s needed. But if you want your kid to become the next Mike Trout, you need to get them the right gear. In this article, we’re going to cover some of the best T-ball bats you can find on the market today! Tee-ball USA is the governing body for all things Tee-ball related in this country. According to them, only bats between 25 and 26 inches are considered regulation. This means the bats that don’t follow these standards will not be allowed in league play. We’ve done our best to stick to regulation-sized bats in this article, but we’ve made sure to mention if a bat isn’t regulation! Although, little league rules aren’t set in stone and change somewhat often, so if you want to be updated on the latest rules check out their official site for Tee-ball. The Rawlings Raptor bat provides the perfect combination of power and control for any kid under 10 years of age. Rawlings has emphasized on keeping this bat as light as possible when designing it. This is especially crucial for younglings who don’t have the same strength as an average teenager. According to tests, this bat has a drop weight of -12. This means that the bat will always be 12 ounces lighter than its length. So a 25″ long bat would weigh just 13 ounces. This is extremely light and those who have tried to use a wiffle bat with a regular baseball might be a bit worried. The problem with lightweight bats is that they aren’t very dense. This means that no matter how hard you swing it, you won’t be able to generate much energy. Luckily, Rawlings addressed this issue and have resorted to using a perimeter weighted end cap. This cap works by increasing the mass of the bat without increasing its weight. The cap also serves another purpose: it provides a better energy transfer into the ball while helping you swing the bat much faster, as well. Another great feature about this bat is its sweet spot. The Raptor offers an unconventionally large sweet spot thus allowing a much larger margin of error than other bats out there. Kids picking up Tee-ball for the first time (and even those who have played the game for a while) will find that hitting home runs with this bat is much easier than any other bat they’ve used before. Consistency is key when you’re picking up any new action. You want to quickly find the right way to hit the ball and repeat the action a thousand times over. Many wooden bats don’t offer much consistency and this can be a problem for young kids still learning the ropes. This bat, however, uses a barrel made from a durable alloy blend of aluminum for consistency. When you combine this with the large sweet spot you get the perfect first bat for a kid. We loved the color scheme used by Rawlings and the neon electric bolts go really well with the matt grey finish. And most importantly, this bat is USA T-ball approved. This means you can use it in any T-ball league across the country. To emphasize this further, the manufacturers have stamped a USA baseball logo on it – this is something many leagues require. You can find it in 24″, 25″ and 26″ length variants weighing 12, 13 and 14 ounces respectively. IMPROVED HANDLING - The hi-tack perforated grip ensures greater control and handling, even for young hands. Comes in a variety of awesome colors, including blue, green, and white. Officially endorsed USA Baseball tee ball bats with logo. Franklin is one of the biggest names in the backyard games industry. These guys manufacture a ton of toys including things like basketball hoops and football goal posts. However, MLB-related gear is their specialty. 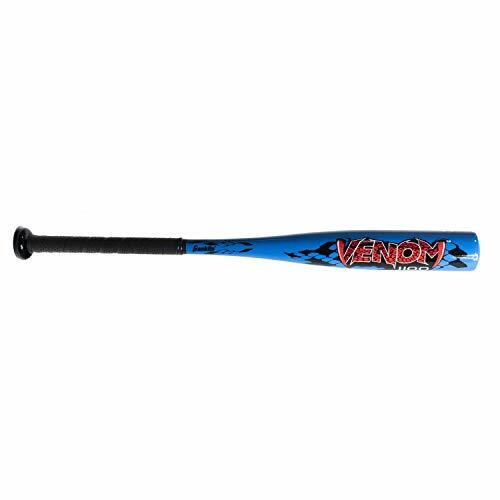 The Franklin Sports Venom Bat works great against a soft-core T-ball and for batting drills when kids are practicing their form. Unfortunately, many people have complained that this bat has caved in after using it against a regular baseball or a hard-core t-ball. This bat uses a 6061 Alloy of aluminum offering an extremely durable construction. Many users have raved about it’s popping sound and loved the quality of the material. The bat was manufactured to always provide a durable weight distribution no matter how it’s held or swung. This makes the bat feel pretty stable and sturdy. The handle uses a Hi-Tack Perforated grip that helps kids grip the bat better by preventing it from slipping. The foam on the grip is pretty durable so you won’t need to worry about it ripping halfway through the game. There are 9 possible variants of this bat. It’s available in White, Green or Blue colors with each color offering 24″, 25″ and 26″ length variants. Depending on your color choice, the bat will come with a drop weight of -12, -11 or -10. All the colors are really vibrant and will hardly fade away with time. No matter what variant you choose, all bats are USA T-ball approved and come with the USA T-ball association Logo stamped on the handle. This means this bat can be used to play in any little league tournament in the country. However, many users did complain about the delivery and packaging quality of the product. When ordered from Amazon the bat is only wrapped in a single plastic shipping bag. No boxes or bubble wrap. Some users have even reported receiving a dented bat, so be wary of that. The 2019 version of the Louisville Slugger is a great bat for any young player, and the aggressive red patterns on the black backdrop immediately stand out and catch eyes. Just like many other top tier T-ball bats, the Louisville Slugger uses a custom alloy instead of wood. Doing so allows the bat to offer better stability and consistency when swinging the bat. 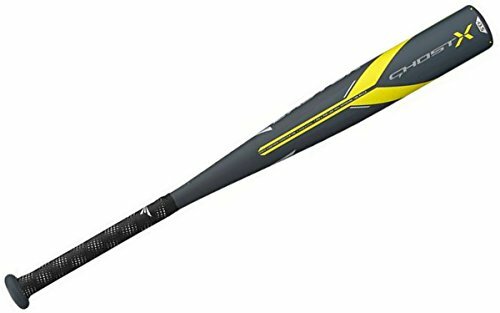 In terms of performance, the alloy in this bat is at power with the Rawlings Raptors and much better than the Franklin Sports bat we reviewed earlier. However, it’s still nowhere close to the Easton Ghost X in either performance or power, in our opinion. Although some users have reported to using this bat with hardballs, we recommend you stick to using soft-core t-balls, especially if you want this bat to last. We should also mention that while the manufacturer does offer a one-year warranty, it doesn’t include damages taken while using the bat. 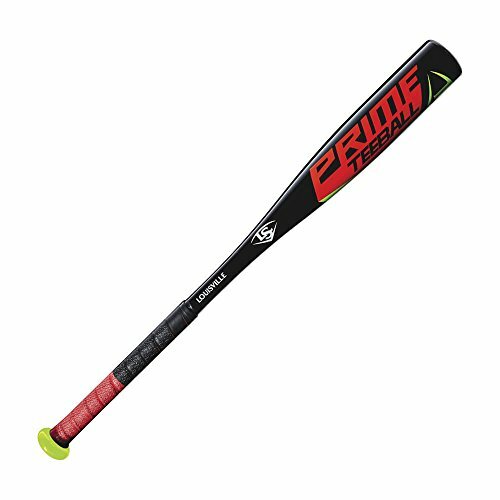 The Slugger Prime has a drop weight of -12.5, which is right in the middle. You’ll find bats with lower drop weights (such as the Easton Ghost X) and those with higher (such as the Raptor and Franklin bats). When picking a bat, it’s best to let your kid get feel for it and adjust accordingly. By starting out with the Louisville, you make it easier to zone in on the perfect bat for your kid. If the bat is too heavy for them then you may want to try out the Easton Ghost X next. However, if the Easton Ghost bat doesn’t give much oomph then you might want to check out the Franklin Bat or Rawlings Raptor. Just like the others, this bat is available in 3 variants: – 24″, 25″ and 26″ lengths. All the lengths offer the same drop weight so they weigh 11.5, 12.5 and 13.5 ounces respectively. Each variant also comes with a fade synthetic grip. The grip helps to keep the bat comfortable in your child’s hand. And most importantly, each bat is certified by the USA T-ball association allowing your child to use it in your local T-ball league. It also comes with the USA T-ball league stamp, which some leagues require. Those who have used last year’s Ghost X know that the bat had some problems. Not only was it banned, but it also felt really terrible on mishits. Luckily, Easton has fixed most of those issues and we finally have the bat we were promised. This new bat is essentially a revamp of last year’s model and the superiority is highly distinguishable. One of the biggest changes is that, unlike last year’s bat, we now have an Easton product that follows USA baseball standards. This means your child can use the bat in leagues and associations across the country without any problems. We all know that kids can have short attention spans. If you want them to stick to a sport, they need to enjoy playing. We feel like there is nothing sweeter than the sound of a bat hitting a ball. Your kids will go absolutely crazy for that crackling pop the bat makes every time it’s swung (we certainly did). This will keep them hooked on Tee-ball for sure! Easton Ghost X has a drop weight of -13, which means it weighs 13 ounces less than its length. This is the lowest drop weight out of all the bats we’ve reviewed so far and is very impressive. This extremely low drop weight is great for kids who may not have the power or technique to swing a heavy bat. Most Tee-ball bats are manufactured as multiple pieces that are then molded together. This leads to a slight drop in the stability of the bat. Most of us have come to terms with it as a necessary evil to create budget-friendly bats. But for the first time (to our knowledge), we have a bat made from a single piece of carbon. The Easton Ghost uses its patented Carbon technology that offers better precision and power. Many users loved the single barrel model and spoke highly of how sturdy it feels when you hold it. The single piece carbon also helps make this bat super durable and Easton completely stands behind their product, offering a 1-year warranty for this bat. 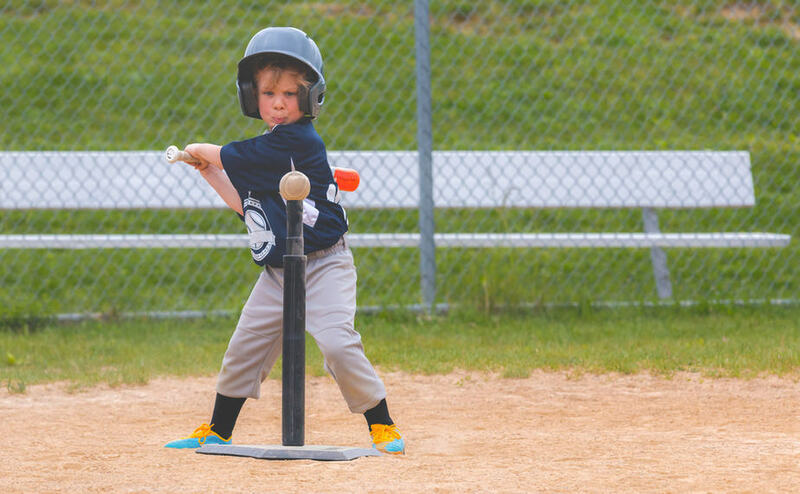 While cheaper options exist, this is still one of our favorite bats for Tee-ball. It’s available in 24″, 25″ and 26″ length variations with each of them having a drop weight of -13. The weights for the models are 11, 12 and 13 ounces respectively. We also loved that Easton has gone to great lengths to make the bat feel great in your child’s hand. They’ve used an All-Sports grip to help kids grip the handle better, which also makes it really comfortable to use. If you’re hunting for a light weighted but well-balanced T-bat for your kid, Easton’s new Ghost x Hyperlite could be the perfect bat for you! The perfect bat will vary a lot based on how much your kid will play and the amount you’re willing to spend. If they’re already able to hit the ball well and with solid contact then splurging on an expensive bat seems to make sense and will help your child get better at the game. Kids are also going to hit a lot further with a heavier bat, but if they still haven’t mastered their technique then buying an expensive bat may not be the best option. It’s good to keep in mind that on most little league teams, all the kids use the same bat during matches so it’s very likely that your kid will only use the bat you purchase during practice and then borrow their friend’s bat in an actual game. Tee-ball USA requires that all bats used should be between 25 and 26 inches long. This is a necessity for the bat to be allowed in regulation leagues. Now, depending on your kids, the length may vary. If your child is tall then you might want to go for a 26-inch long bat. On the other hand, shorter kids should find the 24-inch variants much more comfortable. We have a simple hack to help you find the perfect size for your kid: Measure the height of your kids from their belly button down. You want a T-ball bat that is around that height (when the bat is standing, it should reach near the midsection of your child). Tee-ball requires the use of special balls which are very similar to regulation baseballs but are made softer to help minimize the risk of injuries. Many T-ball bats are extremely delicate and using a regular baseball with them will lead to dents and even may cause some bats to snap. Tee-ball is considered an entry-level sport for baseball. It was intended as a game for kids between the ages of 4-8, however, you’ll often find leagues for kids 12 and older, too. And just like you don’t get kids started with a size 7 ball and a regulation rim, you don’t want your kids to start off playing baseball. The sport is a bit too intense for most kids to start playing from the get-go. “In my years with the Dodgers organization, I have had opportunities to watch youngsters learn about the game, teamwork and life. Tee ball is a fabulous way to introduce the game and to develop the personal skills and attitudes that can mean success in sports and life”. Tee ball (aka T-ball) is a baby step towards professional baseball which is way more safe, as it excludes the pitching part. Young players learn the fundamentals and develop baseball skills in minimally competitive league play. There’s a wonderful emphasis on hitting, running, fielding and throwing in an active game that combines fun and teamwork for children. Overall, the perfect bat for your kids will depend on them. It may be a good idea to let them try out some of their friend’s bats and see which ones they prefer. If you’re still undecided after reading, then we recommend picking the Easton Ghost X bat. Not only is it our favorite bat, but it’s also well-loved by most parents and T-ball coaches across the USA. Although it might be a bit more expensive than some other bats on this list, the quality will more than make up for it over time. Hopefully, you gathered the information you need from our article covering the best Tee-ball bats! Your little athlete will be playing in no time!